Happy Birthday, To Kill a Mockingbird [TSS] – my books. my life. 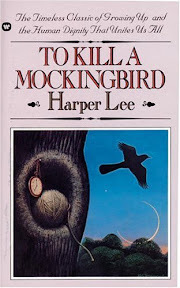 Like most people, I was required to read To Kill a Mockingbird by Harper Lee when I was a freshman in high school. I was a good student and I always did the required reading (at that point at least) but I didn’t always enjoy it. So I didn’t necessarily begin TKAM with high expectations. But from the beginning, I was completely sucked into Scout’s world and taken for a wonderful ride. My 9th grade English teacher went on maternity leave right as we were starting TKAM. Our substitute for the remainder of the year was a teacher we all called “Ms. M.” She was the best sub I have ever had (she eventually got a full time position at my school and still teaches there today). We often read parts of TKAM aloud in class. Ms. M had just moved to Michigan from Tennessee and had this fantastic Southern accent when she read aloud. I would get completely lost in the world of TKAM when she read from it. I used to hate when teachers read aloud in class because I could read much faster to myself, but this was something I looked forward to every day. It remains a strong memory in my life and I will always be thankful to Ms. M for that experience. Despite my love of Ms. M’s reading, I got so sucked into the book that I read ahead (this would not happen to me in school again for 3 more years when I read A Farewell to Arms). I just had to know what happened. I stayed up late one night finishing the book and knew, even at 14, that I had just finished something amazing. A lot of lawyers credit TKAM with inspiring them to become a lawyer. I am not one of those people. But it did inspire a love for literature. I had always been a reader, but TKAM was the book that showed me “classics” could be enjoyable and introduced me to a whole new world of books (I realize TKAM may not be quite old enough to be a classic but it was my inspiration nonetheless). Thanks to TKAM, I approached subsequent required reading with an open mind and sought out other older books that weren’t taught to me. So thank you, Harper Lee, for giving us To Kill a Mockingbird. And a big happy 50th anniversary to the novel. Check out my husband’s thoughts about TKAM here (hint: it is his favorite book of all time). And check out Harper Collins’ 50th Anniversary Edition of the book and the celebration they’ve put together here. It is indeed something to celebrate! I am enjoying reading everyone’s posts about TKAM! Get ready to gasp aloud, Michelle: I have never read TKAM! Yes, it was required reading for my school’s 9th grade English students. However, I was in honors, so I got the great pleasure of reading The Odyssey instead *rolls eyes* TKAM has been on my TBR list for a long time, though. You should read it! And I think it could definitely make a good RBC books. Lots to talk about. Thanks for sharing your love for ‘To Kill a Mockingbird’, Michelle. I have it on the top of my ‘TBR’ list, and am hoping to read it soon. I have seen the movie version starring Gregory Peck and I liked it very much. Your teacher Ms.M looks like a wonderful person. It is great that she still teaches at your school and is inspiring generations of students with her love for literature. For me, English was my favourite subject in school and I typically read all my English texts like storybooks and finished them at the beginning of the year 🙂 I wish we had had ‘To Kill a Mockingbird’ at that time as required reading. Maybe, I might have become a lawyer 🙂 I haven’t been to Ben’s blog in a while. Thanks for posting the link to his thoughts on the book. I am hopping there to read them now.